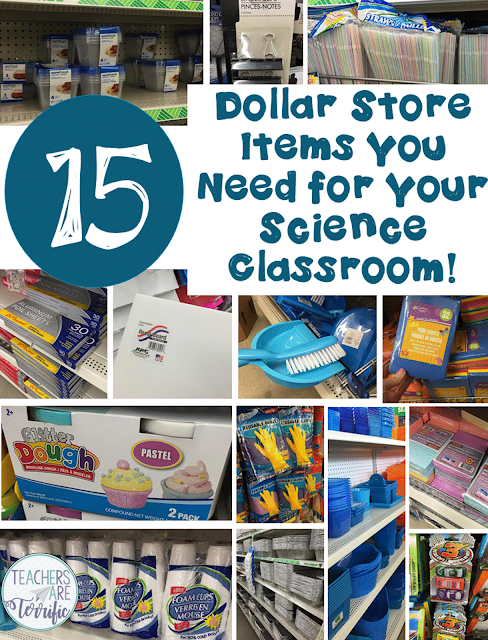 I hope you have a Dollar Tree close to your home because this post is dedicated to shopping at that great little market and getting supplies for your STEM and Science classroom! Which of those dollar bargains are not really bargains? I'll tell you about those, too! One of the things I hear from blog readers, fellow teachers, and just friends is that supplying a science room or STEM lab is costly. Yes, it can be! But some of the best STEM challenges we have completed were made from straws! STRAWS and masking tape, TONS of masking tape. 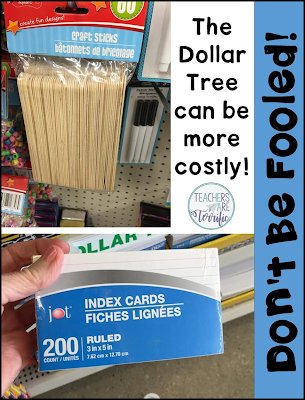 To make my classroom work with a budget in mind I shop at dollar stores, specifically the Dollar Tree. If you don't have one close by try Dollar General, but do some comparison shopping before you purchase things. Are you ready for 15 ideas for shopping? Styrofoam cups. We use these all the time for so many things. I can usually find them in two sizes at the DT. They often have red plastic cups, too, but the package doesn't have many in it and I would need too many packs. Be careful when buying those! Okay, here's a secret. Wal-mart has packs of 100 straws at a cheaper price. but the DT straws are better. They are longer. So, I buy those instead. We use them every week for something! Another secret. These can be costly at Wal-Mart unless you get the WM brand. But the ones at the DT are just as good and less expensive. We use these for storage, projects, water containers, dipping containers, support base, and more. Oh my goodness, we use foil all the time. I buy the largest roll I can find at WM and it is about $15. It is a heavier quality than the DT, but I have not found that to be important. So, I started getting the foil boxes there. Then I found these foil sheets. They are pre-cut so you can just pull out a sheet for each group. Can you say easy? Saves a little time, too! Did you know you can get this at the DT? At WM it's $3 and at Hobby Lobby it's even more. We use foam board for connectors, bridges, ramps, and other projects. These are pre-cut foam sheets. They are thin and you might want the thicker kind, but these have worked well for us. A pack has about 5-6 different colors. We use these a lot. 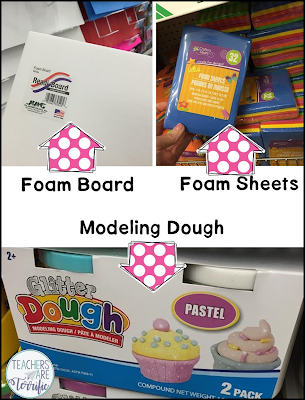 DT has two sizes of cans of play-dough. It is almost always good quality and for what we use it for it has worked fine. I even save the little empty containers in case we ever need them! Okay, these items are not essential, but just good ideas. NOTEPADS- I have little pads like these at each workspace. The kids use them often to just jot things down. You can get a pack of 3-4 little notepads at the DT. LITTLE CARS- Last spring we did a challenge that involved little cars and I found them at WM for 78 cents, but at the DT you can get a pack of 3. If you ever need little cars! BINDER CLIPS- We have used these in projects and I use them all the time to clip papers together. At Staples a big pack is costly! Course Staples has pretty colors! FOIL PANS- We have used pans like this for lots of things. Erosion experiments for one thing. You can get all sizes at DT and usually in a pack of 3-4. They make great carrying trays or drip trays, too. BROOMS- Every lab table in my classroom has its own broom and dustpan. I do not clean up after kids! This year I may get more of these so that every table has 2 sets and I also have 4 large brooms! We are very messy! 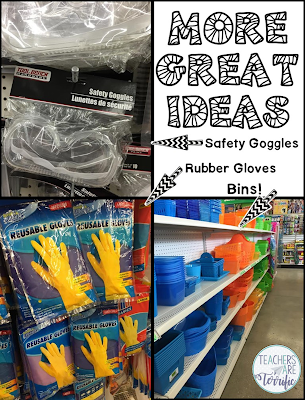 SAFETY GOGGLES- I have lots of these and kids love them. LOVE THEM. If you don't have sets ask local businesses for donations (that's where I got mine) or you can get them for $1. PLASTIC BINS- Of course, you need these! But I bet you already have ten tons of baskets and bins. 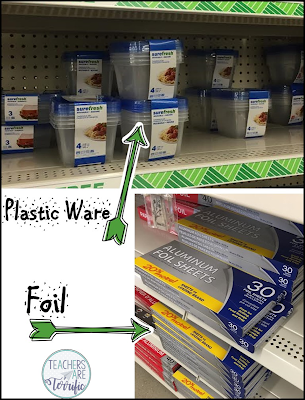 Dishpans are another item we use all the time! Now, here are two more giant secrets about the DT. Don't buy craft sticks there! That photo is showing you a pack of 80, I think. Wal-Mart sells a box of 1000 for $4.99. Hobby Lobby also has a box of 1000. Watch the HobLob ads and catch their wooden items at 40% off and you can stock up. You can also use your 40% coupon at HobLob. Get your craft sticks there! INDEX CARDS- Don't be fooled. These are cheaper at Wal-Mart and thicker cards. And there you have it! 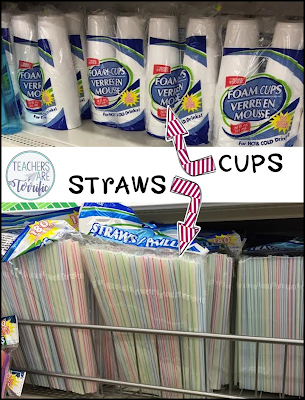 Easy supplies from the dollar store! Best of all, you can add these to a list sent home to parents and they will actually buy this stuff for you because it's only one dollar! 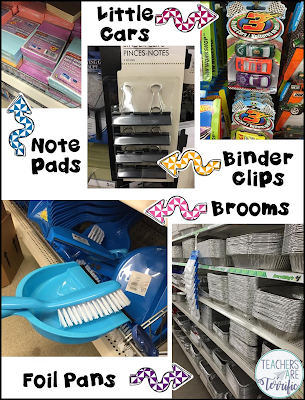 You can also check out my Pinterest board all about classroom supplies!